Once a hefty body-on-frame truck-based SUV, Nissan’s Pathfinder was reinvented some years back as a midsize-to-large crossover utility vehicle. For 2014, this 7-passenger people-hauler rests on its laurels with essentially no changes, except for a new Hybrid edition that’s covered as a separate vehicle. Again delivered in 4 trims, the base S, the lower-midrange SV, the upper-midlevel SL and the flagship Platinum, this marginally less rugged, somewhat less off-road-capable but superbly commuter-friendly and mall-moseying mini-ute boasts a touring-oriented suspension and continues carrying the standard front-wheel drivetrain (FWD). As is traditional, however, this downsized Nissan can be delivered with an all-wheel-drive (AWD) system sporting the automaker’s touted driver-selectable 4-wheel-drive (4WD) mode that locks in a 50/50 power split to front and rear wheels for added confidence in mud and snow. In auto mode, meantime, this system allows cruising in FWD under normal conditions, with torque automatically transferred from the wheels that slip to the wheels that grip, in front and rear, when things get slippery. Of course, as with previous years, the 2014 Pathfinder lineup totes up to 79.8 cubic feet of cargo with the rear rows of seats folded, while Nissan crows once again about the easy-fold second- and third-row seats. The ubiquitous variable-valve-timed 3.5-liter V6 powerplant again gives the 2014 Pathfinder its go, with a continuously variable transmission (CVT) providing management of this well-wrought 6-banger’s 260 hp and 240 lb-ft of torque. Towing is maxed out at 5,000 pounds with the proper equipment, while mileage is estimated at 20 mpg city/26 highway in the standard FWD versions and 19/25 for available AWD editions, all of which is not too shabby for the class. Standard goodies gracing the base Pathfinder S, meanwhile, include 18-inch alloy wheels, a rear spoiler and a roof rack outside, with cloth upholstery, reclining second-row seats and full power accessories among the amenities adorning the inside. Of course, cruise control and telescoping tilt-wheel steering return for 2014, as does Nissan’s Advanced Drive Assist Display… sort of an overwrought trip computer with 4.2-inch color monitor… and tri-zone climate control. Also returning for this year’s S trim is a standard 6-CD changer with 6 speakers. The next-up SV trim adds a power-adjustable driver’s seat, simulated wood cabin accents, a rear-view camera and rear parking sensors, as well as reducing the audio system to a single-CD player, with satellite radio and a USB port making up the difference in CD capacity. Oh, and Bluetooth hands-free calling also adds to this lower-midlevel trim’s worth. Next in line, the upper-midrange SL tosses in a power liftgate, leather upholstery, heated power-adjustable front seats, a remote garage door opener, an auto-dimming rear-view mirror and memory for driver's settings. Lastly, the top-shelf Pathfinder Platinum throws in 20-inch painted alloy wheels, a trailer hitch and wiring, a simulated aerial-view camera, a heated steering wheel, additional driver-memory settings, a DVD-capable entertainment system with 13 Bose premium speakers, and a hard-drive-based navigation suite with 7-inch touchscreen display. Each of the latter 2 features, by the way, remains optional in the SL trim and begets the SL Premium sub-trim. Speaking of options, many available add-ons in lower Pathfinder trims again include a number of items found standard in higher trims, while all variations can be delivered with available splash guards and illuminated kick plates. Roof rack crossbars are additionally available for all trims, while the SL and Platinum trims again become eligible for an available Premium upgrade package that boasts a power-opening panoramic moonroof and rear-seat DVD entertainment system. Standard safety features of note throughout the 2014 Pathfinder lineup include 4-wheel antilock brakes (ABS), traction and stability control, front side-mounted airbags and 3-row head airbags. A remote antitheft alarm is also standard lineup-wide, with the SV and higher variants additionally equipped with standard dusk-sensing headlights and a post-collision safety system. 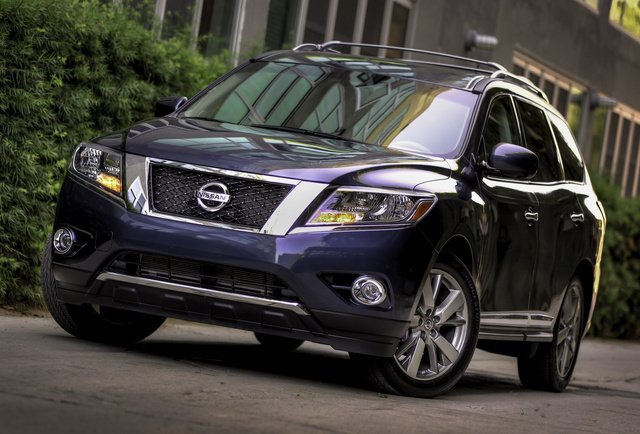 What's your take on the 2014 Nissan Pathfinder? Users ranked 2014 Nissan Pathfinder against other cars which they drove/owned. Each ranking was based on 9 categories. Here is the summary of top rankings. 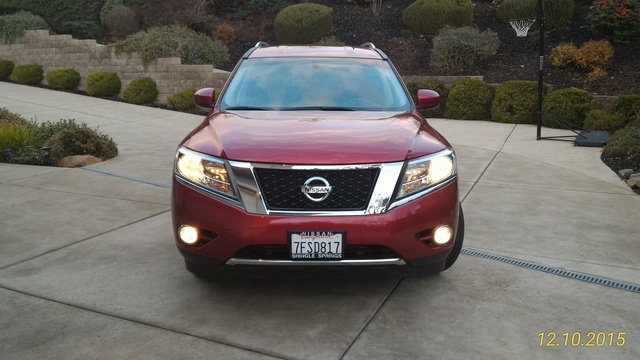 Have you driven a 2014 Nissan Pathfinder? Can you use a 2009 Nissan Pathfinder battery in a 2014Nissan Pathfinder? Where Do I Find The Fuel Pump For A 2014 Nissan Pathfinder? I have a 2014 Nissan Pathfinder with around 80,000 miles. It has begun to produce white smoke when starting up, but doesn't always do this. at low speed it is not as noticeable, under 30 mph. as I increase speed it increases in a humming noise ?